…in the critical moments as first responding deputies were searching for an active shooter on the property of Marjory Stoneman Douglas high school, a commanding officer on scene apparently ordered some of the initial responders to “stage” and set up a “perimeter” outside — instead of immediately ordering or allowing officers to rush in to neutralize the suspect, Nikolas Cruz. 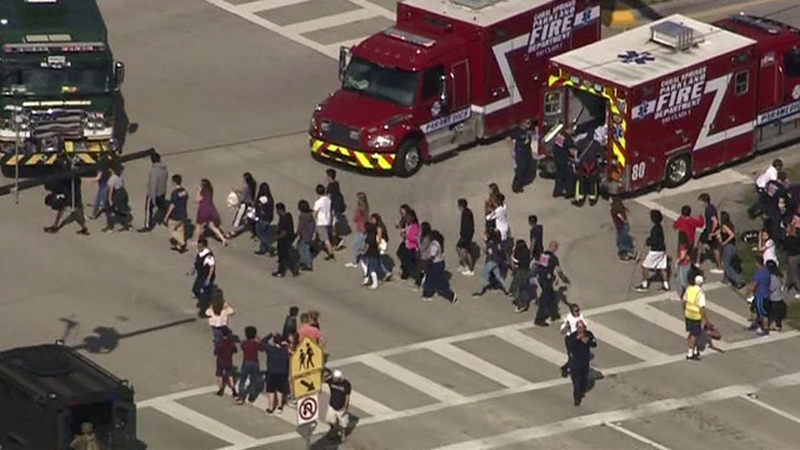 According to other police officials (not those involved) said there may be a good reason for the orders, but Broward and state officials will not discuss the situation. What appears to corroborate all of the sources’ allegations of bad commands is a portion of the February 14 dispatch log obtained by Fox News that appears to indicate there were several orders for crews to stage and form a perimeter. The logs appeared to indicate that at the same time these commands were given, law enforcement still had not located the active shooter and even a responding air crew refused to take off — apparently in fear of being shot down — because it was not established the shooter was in custody. Timeline (and much more) at link. The Florida House has subpoenaed responding law enforcement agencies and the Broward County Public schools for records related to the shooting for its own investigation. This entry was posted in Government, News, Terrorism, The Culture. Bookmark the permalink. Seems that protecting themselves was their first priority. Protecting and saving lives was a distant second. Have any other “News” organizations “repeatedly” asked Broward Cty. for info and truth? I’m not a fan of FOXNews, but I’m not a fan of TV news, period, or even radio reportage, for that matter. But I bet none of the other networks, besides maybe OAN, have. I’m sure most other networks have contacted Broward Cty. repeatedly for instructions and scripts, though. I like Pull versus Push when it comes to information gathering. Pull is getting on the internet. Think CTH in the Trayvon and Mike Brown days. Pull is going to the library and doing actual academic research. The internet is the Biggest Library Ever. Push is sitting in a high-chair at the table being fed, where your only choice in the matter is deciding which mom or dad is flying the airplane-spoon into your waiting mouth, by changing to another channel. So passive. So sad. The Push purveyors who actually have internet presence, laughable as the content and quality may be, are still doing Push in this medium. They have videos which auto-play when you hit the article, unless you’re an intelligent person who knows how to avoid that, because you prefer Pull your information. They disable comments, very selectively, on articles upon which many, many intelligent commenters might say something contrary to the narrative. This I’ve learned from long perusal of local ABC, NBC, CBS sites, USA Today, and many, many other actual ordained and grandfathered “news” organizations’ coverage of a metric s**t-ton of stories. The internet, using Pull, is a true University. An actual one. We all pull, and many of us do the pushing, too, because it’s allowed. It’s a whole different animal than radio, print, or television. It’s We The People. It’s crowdsourced research and sharing of info. Despite the possibility of paid trolls and bots and whatever, it’s still many leagues better than the others. The “48-hour rule” regarding not immediately believing Anything At All that comes out of the MSM maw has become the “3-month rule”, and the “10-year rule”. Sad. The Internet…the single greatest educational tool ever placed in our hands, Guttenberg on steroids. Seems a lot of people approved of the PROMISE program, not giving any thought to potential abuse and/or consequences. edia’s gunna have to worx harder to make this all about gun violence. Gross incompetence…ot worse…nonono, this is all about that evil gun seducing an innocent child, turning him into a wantonm killer. People aren’t to blame, after all, evil inanimate objects are.